For most employees, qualified retirement plans are a critical component of their retirement savings strategy. For others, qualified plans place restrictions on their utilization of such plans, so they have to look for other ways to save. That’s why employers often offer both qualified and nonqualified plans. Why are there two classes of plans, and how do they differ? In the simplest of terms, qualified plans qualify for favorable tax treatment if they meet specific requirements set forth in Internal Revenue Code (IRC) 401a and ERISA. Nonqualified plans comply with IRC 409A and are exempt from most parts of ERISA. Therefore, such plans don’t qualify for the same favorable tax treatment as qualified plans. Employers may also deduct contributions as wages in the year in which they’re made, and there are no taxable consequences to the employer on plan earnings. Highly compensated employees are most often the senior leaders/executives in the organization. All employees who aren’t determined to be highly compensated (as defined by the IRC) may enjoy the full benefits offered by their plans. For 401(k) plans, the broad base of employees may contribute up to the IRC contribution maximum ($18,000 for 2017). However, those who are defined as highly compensated are often restricted from contributing the maximum. Their deferral percentages are limited to an amount based on plan tests, such as the Average Deferral Percentage (ADP)/Average Contribution Percentage (ACP). These tests are used to ensure that all participants are benefiting equally from the plan and to determine that participants are not exceeding the IRC contribution limits. 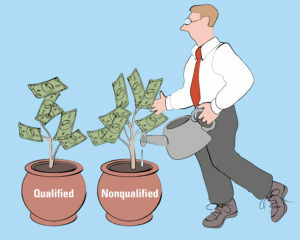 Nonqualified plans are for a select group of management and/or highly compensated employees. They don’t qualify for the same favorable tax treatments as qualified plans and are exempt from many IRC and ERISA requirements (including testing) because they aren’t broad-based employee retirement plans. Examples of nonqualified plans are deferred compensation plans, supplemental executive retirement plans, split-dollar arrangements and other similar arrangements. Contributions to a deferred compensation plan will reduce an employee’s gross income, but there’s no rollover option upon termination of employment. Contributions into a nonqualified plan aren’t deductible as wages by the employer until distribution of the amounts in the participant’s account. Nonqualified plans are established for a number of reasons, such as to help restore retirement parity (due to testing and contribution limits as described above). The plans also provide a means to recruit senior leadership and reward/incentivize strong performance. Though nonqualified plans are not broad-based employee benefit plans, they still must comply with IRC 409A. This is a section of the code that provides guidance regarding the timing of deferrals and distributions. The amounts deferred into these plans aren’t segregated assets as in a qualified plan; instead, they’re held as general assets of the organization. Thus, there’s risk of forfeiture to the highly compensated employee in the event of bankruptcy. This is one of the main reasons a nonqualified plan is not available as a broad-based employee retirement option. Another notable difference is the crediting of interest/earnings to a nonqualified plan. These plans are informally funded, which means that assets aren’t set aside from the general assets and also aren’t within the control of participants. Most organizations end up investing in mutual funds or corporate-owned life insurance (COLI) to help them offset the growing account balances. However, any interest or realized gains in a mutual fund are taxable to the organization. These plans should be designed with the financial impact to the organization in mind while balancing that with the needs of the participants. Both qualified and nonqualified plans are key components in an employer-sponsored retirement package. While both plan types should be reviewed regularly for legal and accounting compliance, they should also both have their funding (qualified plans) and corporate financing (nonqualified plans) options reviewed. As plans grow, more investment options become available for qualified plans, and the corporate tax liability on nonqualified plans should be more actively managed. With the help of an experienced advisor, organizations can structure a retirement package that can meet the needs of all employees without being costly and inefficient at the corporate level.